Had the small UN airport defence force (which included many who would not normally have expected such a role to be thrust upon them) realised that the Turks did not recognise the agreement for the United Nations to control the airport, their sleep might have been even more disturbed. There was some confusion between the Turkish military and their government in that it was believed in Ankara that the airport was already under Turkish control.......something that the military were still determined to achieve.......ceasefire or not. During the day of the 24th July, TV and Press correspondents were shown around the airport to confirm that, contrary to rumours, it was still under the control of the UN. Members of 1 Airborne Battery (Royal Canadian Artillery) lifting sandbags up to the roof of the terminal. Several ropes were affixed to a rubbish bucket filled with sandbags which was then pulled up through a skylight. Further reinforcements depended on the outcome of talks at UN Headquarters in New York and with the British Goverment in London. It was recognised that only the British (in the nearby SBAs) were in a position to support the UN forces at the airport. The British urged UN General Secretary Waldheim formally to request the reinforcements that were ready and waiting and for all possible pressure to be applied on the Turks to abandon any attempt to capture the airport. As late as 21:00hrs on the 24th July, in response to threatening Turkish movements, further Press & TV correspondents were brought to the airport to see that it was still firmly in UN hands. Around the same time (21:00hrs 24th July), confirmation was received that troops and armoured vehicles from 16th/5th Lancers and 4th/7th Dragoon Guards together with infantry from the 2nd Bn Coldstream Guards were being sent from the SBAs. In London, the British government was becoming increasingly anxious about the vulnerability of their troops at the airport. "The UN Peacekeeping Force has been instructed to resist any attempts by Turkish units to occupy Nicosia airport. We ask you to forward to your Government immediately our request that they order their forces not to go into action against the UN. We trust that they will listen to our appeal". The first of the reinforcements arrived at the airport around 01:00hrs on the 25th July and most were in place (with UN berets and still wet UN markings painted on their vehicles) by early morning. The Coldstream Guards concentrated on the defence of the terminal building whilst the Saladin armoured vehicles were to position themselves around the northern perimeter fence to act as a deterrent and as a 'trip-wire' to forewarn of any threatening Turkish movements. The prospect of Turkish air attacks galvanised the British governement into action and twelve Phantom FGR2s from No:6 Squadron and No:228 Operational Conversion Unit at RAF Coningsby were dispatched to RAF Akrotiri. Flying in pairs and refuelled in flight, the first eight arrived at 05:00hrs on the 25th July and by 06:45hrs were refuelled, armed and ready for action. The remaining four arrived and were available a few hours later. There were amazing sights and actions when the sun rose at 04:50hrs on the 25th July as the following descriptions explain. Once airborne (in a UN helicopter) I was able, for the first time, to see the panorama below. I was concerned at how close my forward Saladins were to the leading Turkish tanks – 8 to 10 yards! I also quickly established that there were only five Turkish tanks and a battalion of infantry dug in along the perimeter. It was also fascinating to look down on the airport runway which was littered with debris, crashed aeroplanes and also quite badly cratered. We landed at the airport boundary road. I walked forward to talk to the Turkish battalion commander. We threatened each other politely for a short while without much effect. In the end I said, we are professional soldiers like you. We have been told to stop you taking the airport and that is exactly what we are going to do. Do not forget we have 12 RAF Phantom jets on call which are better than your Sabres and could destroy your battalion. He seemed very impressed and worried by this statement, and after some consultations on the radio he replied through the interpreter: “Yes, I quite understand. There will be no attack”. As dawn broke the tension became fairly high as troops reported enemy [sic] tanks and infantry at very close range. 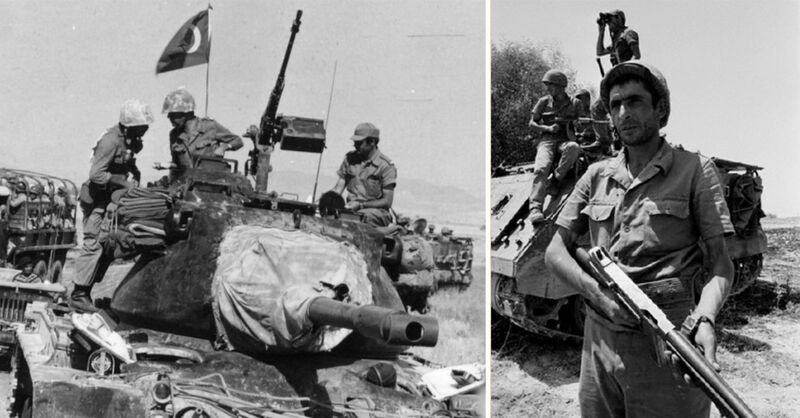 I could see one of our Saladins and 50m in front of him two Turkish M47s. I remember thinking that it wouldn't make much difference which side opened fire first- one of the tanks would get the Saladin. I could not differentiate between the enemy front line and our own forward troops, and told the Squadron Leader that, if a friendly airstrike was ordered, our men would probably receive as much fire as the enemy. He replied quite calmly that nothing could be done about this and that the RAF would just have to do the best they could. I am happy to be able to reaffirm the assurances conveyed earlier in the day to your Excellency by my Prime Minister. I would like to reiterate that, without prejudice to the contentions of the Turkish Government as to the legality of the United Nations presence at the Lefkosa (Nicosia) airport in Cyprus, the Government of Turkey undertakes not to attempt to assume possession of the Lefkosa (Nicosia) airport by force, the threat of force or other means of coercion. I hope, Mr Secretary General, that this letter will help to relieve the understandable tension under which we all lived today. It can be seen by the above timings that what was a very dangerous situation was actually defused before all of the reinforcements had settled into their defensive positions. From early morning on the 25th July 1974 to the present day (January 2017) the airport has remained a United Nations Protected Area. Only access by the UN (and other authorised visitors) is allowed and the facilities continue to fall into dereliction.